This past Sunday I watched Danny Boyle’s Sunshine for about the tenth time. At the time of release four years ago I seem to remember it getting some mixed reviews with very few reviews praising it. Having just looked on IMDB, time seems to have been kind to the film with an average viewer rating of just over 7/10. Do you have a book or a film that really gets under your skin? You love it in spite of its flaws and it has a certain something you can’t quite put your finger on? Sunshine, for me, is one such film. It isn’t just the haunting and lonely atmosphere, it isn’t just the powerful signature theme that is both uplifting and melancholic and just… right for the film (Adaggio in D Minor), nor is it the claustrophobia, the sense of desperation, exhaustion and stress that we share with the group, or even the chemistry between them. Only dream I ever have… is it the surface of the sun? Every time I shut my eyes… it’s always the same. No, what really gets under my skin is the sun itself. 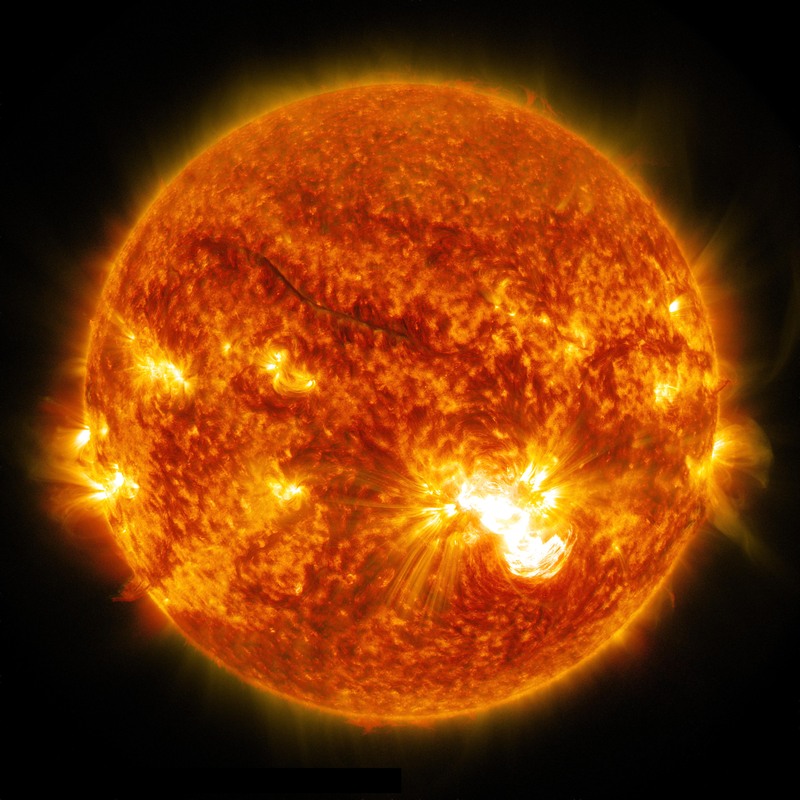 This giver of life, this star with its imperceivable temperatures, this raging ball of gas is so central to the plot and to the characters lives aboard Icarus 2. We see its awesome power as the characters sit transfixed at the screen showing the raging globe in all its powerful majesty. We also have wide sweeping shots of Icarus 2 and its shield that is so vital to the survival of the ship as it is pounded by the heat of the furnace and the deafening radio static that accompanies it. In contrast we see that they are alone. The ferocious sun, the ship and the blackness of space. For those who haven’t seen it and do not know the plot, the sun is dying, losing its temperature and sending Earth into an ice age. The plan is for a ship to fly there and launch a bomb into the centre of the star that will begin a chain reaction to restore it to life. Only, this is the second ship; the first disappeared with no clue as to its fate. One of the most visually spectacular scenes is the repair of the shield. In the meantime, they have received a distress call from the first ship Icarus 1 which disappeared on its mission seven years before. Icarus 2 changes direction to rendezvous with it. But the navigator has forgotten to realign the shields meaning that the ship suffers damage, including its hydroponics garden (vital for food and for oxygen generation). To cut a long story short, part of the shield has been damaged but can be repaired. They must realign it again in order that the crew can get in front of the shield. The repairs are successful but it comes at a cost; the Captain is incinerated when the computer automatically realigns the shield with him still in front of it. The mission is several years old at this point and because the sun is all-consuming (the quote I provided at the top was from “Cassie” played by Rose Byrne), it is understandable that Pinbacker (Mark Strong), Captain of Icarus 1, was driven insane, creating his own personal religion in the worship of the star. he has survived for seven years “talking to God”. In the final showdown he attempts to prevent Capa (Cillian Murphy) and Cassie from detonating the bomb that would rejuvenate the star and halt the Ice Age taking hold on Earth. Another visually spectacular scene occurs at the finale as Capa and Cassie ride the bomb into the star, setting off the chain reaction. The film is worth watching for these two scenes alone. There is also a touch of the abstract. When we finally see the burnt Pinbacker, his image is blurred, he phases in front of the camera almost like a digital television signal experiencing interference. The implication is that he has become one with the sun and maybe even part of it. At first I didn’t like it, I found it too paranormal but when you read it as an abstract meaning where Pinbacker has created it as God and himself as the messenger, it makes sense. All of these elements above for me really demonstrates Sunshine as a modern scifi classic. In psych tests on deep space, I ran a number of sensory deprivation trials, tested in total darkness, on floatation tanks – and the point about darkness is, you float in it. You and the darkness are distinct from each other because darkness is an absence of something, it’s a vacuum. But total light envelops you. It becomes you. It’s very strange… I recommend it. A film that I thought was great but that makes me physically cringe with discomfort whenever I watch it. The sun quite seriously scares me at planet Earth ground level on a bright day, the thought of getting even a little closer to it scares me the way everything scares a Pierson’s Puppeteer. I’m a sun wuss! For me that is classic Danny Boyle and I wouldn’t love it half as much if he didn’t manage to portray the sun as such a menace. I’m going to watch it again soon with Prof Brian Cox commentary (he was the astrophysics advisor). I’m such a geek!